Students are set to shut down Colombia’s cities on Wednesday in President Ivan Duque‘s first confrontation with opposition resistance against his hard-right policies. The protests will take place in cities like Bogota, Medellin and Cali, and are likely to cause chaos in the cities that are already suffering major congestion in traffic. The protests will be a first indication how Duque will react to protests against his hard-right government and an indication of the opposition’s ability to abide by Colombia’s strict protest regulations. Colombia’s students will be the first to find out how Botero — a former business leader who is now in charge of both the military and the police — instructs the police on how to respond to protests. Students attempts to address Congress on Tuesday were cut short by far-right Senate president Ernesto Macias, who has been accused of falsifying his high school diploma. 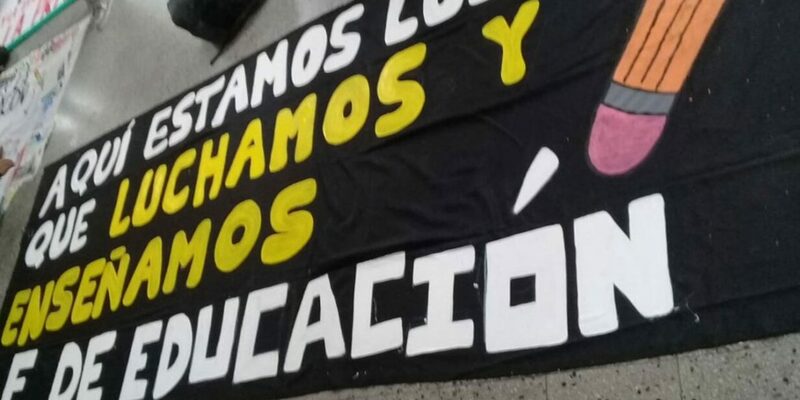 The students and teachers’ organizations are striking to demand more funds for Colombia’s chronically underfunded education system. They are supported by the country’s leftist opposition that has rejected Duque’s plans to increase the country’s military budget while cutting funds for social policies, particularly those promoting peace in the war-torn country. The opposition and the education sector demand the government reassign $325 million (COP1 trillion) of the proposed $1,1 billion (COP 3.5 trillion) military spending increase to education. It is clear that the government should not increase the budget for military expenses, but rather increase those for education, health and other basic needs of the population. We are accompanying the universities’ requests for more budget in the face of their crisis. And we hope that the minister will listen and approve the proposals. Opposition leaders will meet with Finance Minister Alberto Carrasquilla on Thursday to surrender their counter-proposals for the country’s 2019 budget the government wants to change. Next year’s budget was initially proposed by the government of former President Juan Manuel Santos in July, but rejected by Duque who has fiercely opposed his predecessor for years. The president did not respond to the students and opposition’s demand to close the deficit in education. Student organizations were also the first to take on the Santos administration in 2011 when tens of thousands of students effectively shut down Bogota for days.